Healthy Hair Dye - I've Finally Found It! — ecobabe. Healthy Hair Dye - I've Finally Found It! After many months of research, lots of questions from you babes + asking my own questions to my (very patient) hair stylist a million + one times, I’ve finally found the answer…. Is there a permanent hair dye that covers greys + isn’t bad for you? Why YES. YES there is. And it WORKS. 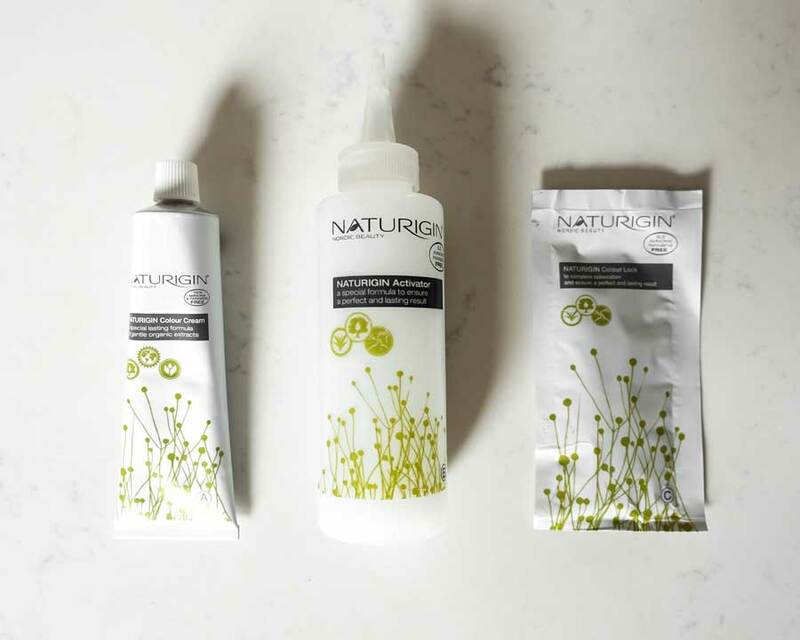 Meet Naturigin, the most natural way of coloring your hair on the market. Not only are these natural hair colors cruelty free, but they’re also made with certified organic + natural ingredients that are better for you (+ the environment). And here’s the kicker… they color your hair without ammonia or bleach!!! THIS IS ESPECIALLY RELEVANT TO BLONDES. Your individual strands have to be altered in order for hair dye to properly work. Ammonia is what opens + lifts your hair cuticle so the dye can penetrate your strand at its base + bond to it. At the same time, peroxide removes your natural hair color, making room for that new pigment to take over. Peroxide will also lift your locks to a lighter color, depending on the percentage that’s used. For highlights, that’s a combination of bleach + peroxide, just like you’d bleach stains on your white clothing. And that’s where NATURIGIN comes in — they’ve figured out how to make hair dye permanent + LIFT your color withOUT using bleach or ammonia!! (Which is basically unheard of since other natural dyes, sans ammonia, will quickly wash out, instead of growing out.) Instead, NATURIGIN uses MEA (monoethanolamine) in place of ammonia. MEA is derived from coconuts, so it’s more gentle on your hair + it’s NOT a gas like ammonia, so it doesn’t get into your airways. And yes, some of NATURIGIN’s colors can even be used for highlights — no bleach, just peroxide! (I have to point out that some people are also against hydrogen peroxide but since we use it for natural teeth whitening, natural antiseptic, etc, I am very okay with it.) Additionally, NATURIGIN includes natural oils + pure extracts to take care of any stripping or drying. Speaking of highlights, this is an AT-HOME KIT. It only takes 30 minutes. I brought the kit to my hair stylist Anjeza because I wanted an expert to test it out with me. 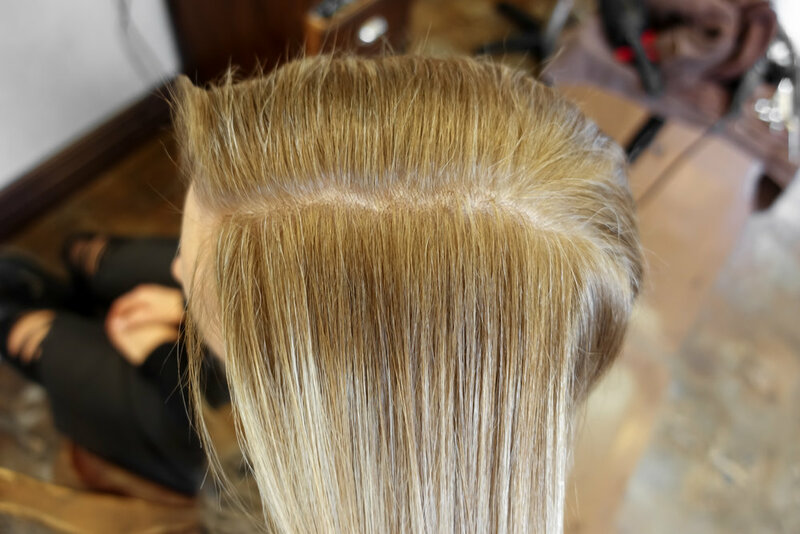 However, if you’re looking to achieve highlights in addition to a base color/root touchup, don’t do the highlights yourself. I’d take those to your stylist (you literally can’t reach around your head by yourself). We swayed from the instructions a bit + I think this is a good tip for you, too. The instructions say to apply the dye from your roots to your ends. We applied to my roots ONLY. Unless you’re going for a completely different color than your existing one, you don’t need to apply the dye to your entire length of hair. If you’re covering up roots + greys like me (I have so many greys 😩), you only need to apply the dye to your roots, where you’re blending what’s grown out. Finally, we washed my hair with the Color Lock + followed with our regular conditioner. And Whalaa!! Well, covering up all my greys + my very outgrown roots should have been a difficult task. But guess what?? Naturigin succeeded. And it surpassed all of our expectations! I chose the volume 8.1 kit. This is the level of lift (lightness in color) the dye will give you. I honestly could’ve went down a level, to volume 7. THAT’S how much this dye lifted my roots!!! Anjeza + I were both completely shocked! We couldn’t believe our eyes. 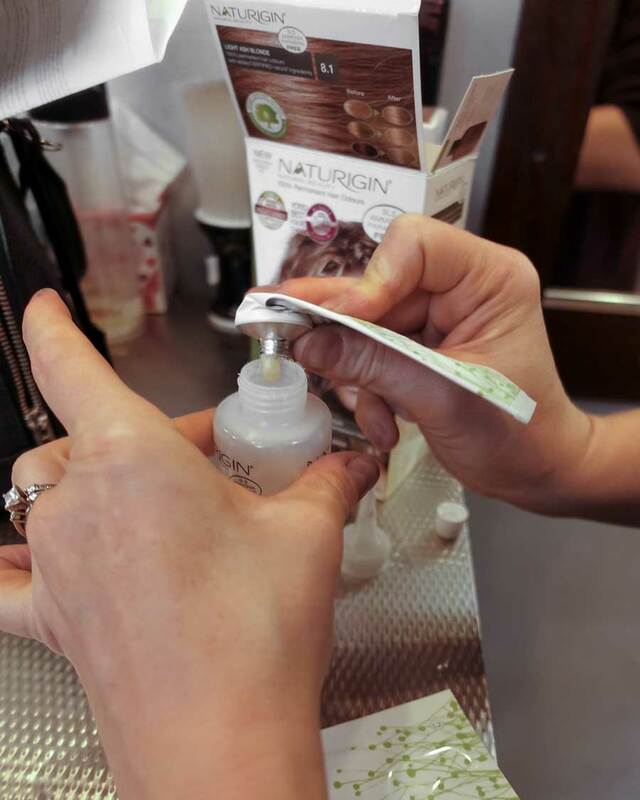 NATURIGIN lifts even more than the standard colors at the salon, withOUT the help of ammonia or bleach. And according to Anjeza, it maintains the exact same grey coverage as those standard colors, too. Here’s another tip… I chose the ‘light ash blonde’ kit, to match my existing color. On me, it was a little more golden in tone. AKA, my roots weren’t quite as cool in color as my ends. So we had to tone them. If this happens to you at home, try a purple shampoo or purple mask. We also planned on doing highlights with the volume 10.2 ‘lightest ash blonde’ kit, but ran out of time. Honestly, the base color on my roots looks so great, I’m happy to try out highlights (on top of the base color) next time. For now, I am beyond pleased + SO excited about NATURIGIN! All in all, I’m hooked. NATURIGIN gives you professional, permanent results that are safe for you + your hair. And 4 days later, my hair actually feels healthier + softer than it usually does. (I didn’t even get a trim.) I’m pretty sure that’s due to the added oils + extracts + to the fact that we didn’t have to use ammonia or bleach in the dye. It’s healthy, it’s effective + most importantly, it’s Anjeza approved!! And you have to think - this is key here - since this hair dye is healthier for you, your hair will be happier for years to come. + + This post is sponsored, but I 100% back this product up + love it. Get the Best Lips of Your Life: Interview with Sara Happ + Giveaway. Meghan Markle's Fave Eco Label + How We Can Afford It.